If your bathroom already has a good ‘set of bones’, then you don’t want to distract or pull away from them, rather embrace them and help play them up instead. Great way to do this is by using just a pop of mixed and matched color, on top of the whitewashed wall, the color will help the walls fade into the background, and not feel so standout! Adding your favorite artists work above the bathtub or toilet is a perfect spot to create a focal point. 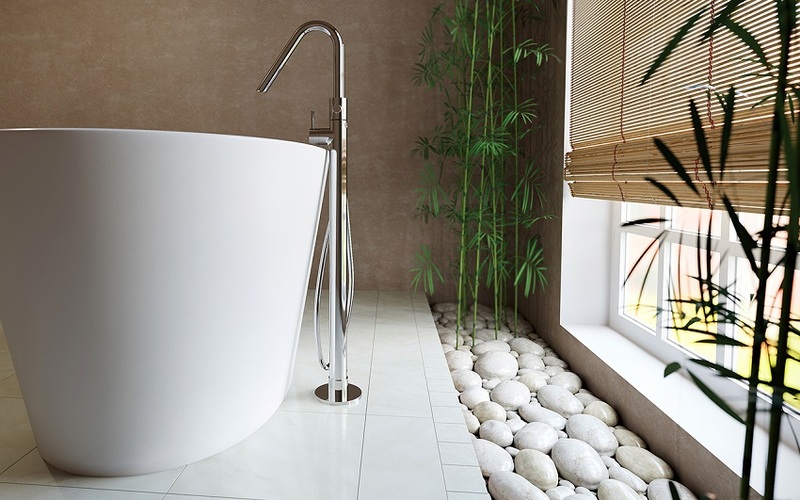 A similar tip to the above one, if you have a unique and interesting bathtub, and sink, keep them unique, but spruce them up with some bold brass or copper bathroom fixtures. Keeping the walls, floor and ceiling white will help make these fixtures stand out and create a dazzling effect in your bathroom. 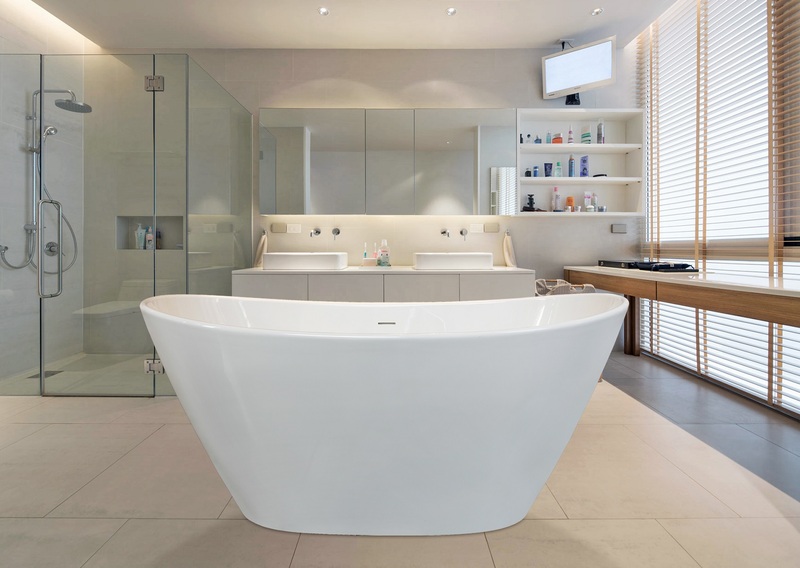 If you live in the country or have a really large backyard that your bathroom faces, then you might want to consider breaking out a wall and installed a large and slick window. Keeping your bathroom décor minimalistic, white and natural, the scenery outside that gets seen through the window will give your bathroom a sense of unique and classy style. If you can have a huge window placed right next to the bathtub, that would be even better – more relaxation, serene views, and natural light! If you have a bathroom that lacks a lot of natural light, you can create and ‘fake your own abundance of light in the bathroom with a light reflector and an all-white color theme. You’ll still need to have a big amount of light fixtures and lighting coming from the ceiling, but with the light reflector placed above the washbasin or bathtub you can instantly open up and brighten up space! If you have too many colors in your bathroom, especially if you’re dealing with a small space, you can very quickly create ‘arguments’ between all the colors, which make the entire décor of your bathroom become way too loud and noisy, leading it to look smaller than it already it. Instead use a variety of white, mate, glassy and texturized wall and floor finishing’s and coverings to help create a larger and more sophisticated space. Rich, warm and characterized wood, stone and greenery is another huge bathroom décor trend right now, and they’re also the perfect pairing for crisp, clean walls! 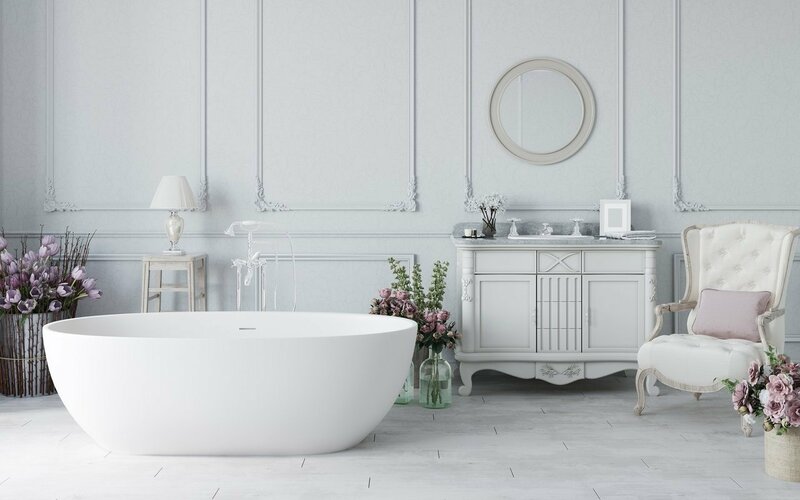 Adding in some natural and warm elements like wood and stone is a fabulous way to bring some personality to a whitewashed bathroom, especially if you can incorporate it into your washbasin or bathtub area.